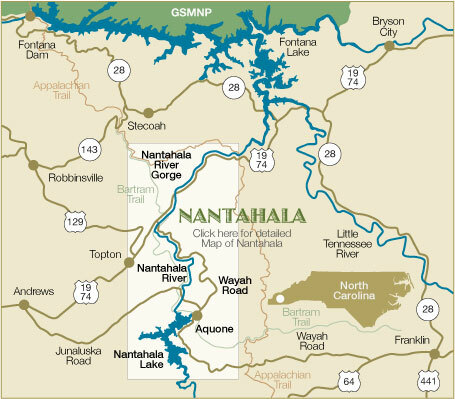 Nantahala means "Land of the Noonday Sun." 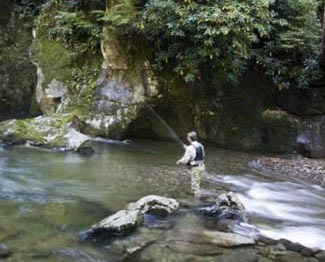 It's the name of a National Forest and the river that runs through the forest, located in southwestern North Carolina near the Great Smoky Mountains National Park. The Nantahala, established in 1920, is the largest of the four national forests in North Carolina, and has elevations that range from 1,200 to 5,800 feet, with the last part of the Mountain Waters Scenic Byway passing through the forest. 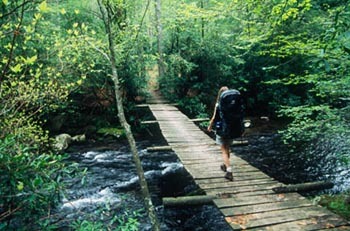 Three wilderness areas are located within the Nantahala National Forest; Ellicott Rock Wilderness is located at the point where North Carolina, South Carolina and Georgia intersect, the Southern Nantahala Wilderness and the Joyce Kilmer-Slickrock makes up the second and third wilderness areas. This rugged, natural setting is ideal for all kinds of outdoor recreation, such as hiking and backpacking, mountain climbing, kayaking, horseback riding and mountain biking. The Nantahala River is one of the country's prime white water rafting rivers, and consists of eight miles of waves and swift currents. The trip down the river takes a little over three hours and is almost continuous Class I and Class II rapids, with an optional Class III at the end, over a three foot high falls. The Nantahala is a short distance to the small town of Cherokee, which is just two miles from the entrance to the Great Smoky Mountains National Park. This area is steeped in Native American history and folklore, and is just minutes to Indian casinos, the Oconaluftee Indian Village, Ceremonial Grounds and Council House and the Cherokee Fun Park. Other attractions near the Nantahala National Forest include the Cherahaula Skyway, Maggie Valley skiing, the tourists towns of Gatlinburg and Pigeon Forge and the Biltmore House in Asheville. 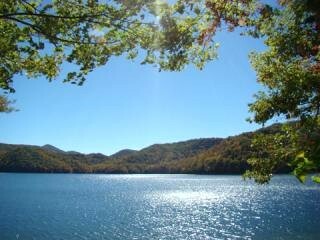 Lake Nantahala is located in the towering mountains of western North Carolina, near the small town of Topton. It has 42 miles of shoreline. It sits like a pristine jewel at the edge of the Nantahala National Forest, surrounded by the rustic beauty of the Blue Ridge Mountains. Activities on or near Lake Nantahala include swimming, boating, fishing, camping, rock climbing, horseback riding, hiking and golf. Whitewater rafting, canoeing and kayaking are available on the Nantahala River, and snow skiing, sledding and snowboarding opportunities can be found at nearby Maggie Valley. 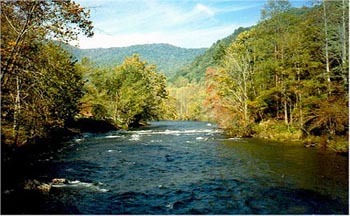 The Nantahala River, which is just south of the lake, attracts anglers from all across the country. The whole area is brimming with crappie, trout, walleye, catfish, bass and sunfish. This area of North Carolina has some of the best motorcycle roads in the country. The Tail of the Dragon has 318 curves in 11 miles in North Carolina and Tennessee. It is considered to be the number one motorcycle and sports car highway in the United States. The Cherohala Skyway is the second most popular road. It consists of 60 miles of very rural, scenic mountain roads in North Carolina and Tennessee. Other nearby touring roads are Devils Triangle TN, The Diamondback NC, Forest Service Dual Sport Riding NC/TN, Moonshiner 28 NC/SC, Six Gap GA, and The Snake TN. Hiking: The Bartram Trail, The Appalachian Trail, Tellico Gap, Appletree Trail, London Bald Trail, and Wayah Bald Lookout. Beautiful Waterfalls: Rufus Morgan Falls, Nantahala River waterfalls, and falls along Wayah Road. Fishing and Boating: Rocky Branch Public Access Boat Launch, Nantahala Lake, Nantahala River, Otter Creek Trout Farm, and Queens Creek Lake. Farms: Yellow Branch Cheese and Pottery, Otter Creek Trout Farm (fishing and tour), the Preserve Farm at Little Choga (farm animals tour), and Running Fox Farms (horseback riding). Outdoor Shooting Range: Dirty John's in the woods at Wayah Bald. Picnic Areas: Nantahala River Launch Site, Nantahala Lake at Lake's End, Arrowood Glade Picnic Area, Nantahala River Ferebee Memorial Picnic Area, Queens Creek Lake, and Nantahala Recreation Park. When you rent our vacation home, there is a printed guide to all of these places and more.